Many years ago, as Karen was accompanying many of the choir and special musical numbers during the Sacrament meeting Christmas program, I was left alone to wrestle with our very young children. So, while the music and talks were likely very enjoyable and deeply spiritual, such niceties had alluded me. Instead, I was ankle deep in Cheerios, sticky with the residue of fruit snacks, and trying in vain to rescue the pew from the orange remains of the smiling cheddar gold fish. Yet somehow, in the midst of my weekly parental plight, I heard what I thought to be the beautiful voice of an angel singing a song that instantly pierced my distracted heart. When I looked up to see where this single, solitary solo stemmed, off to the corner of the choir seats stood our friend Nancy. We had known her for years and I was well aware of her talents on the piano, but I was unaware of her ability to sing. But, as talented as Nancy was, she was not immune to the difficult trials of mortality. She bore the unfortunate burden osteoarthritis that twisted her fingers and joints and caused her constant pain. Yet in spite of this challenge, she stood there singing a song that conveyed to me the Mary’s tender feelings just after the birth of Jesus. The woman who wrote the lyrics to this song contemplated the feelings this humble Mary might have had as she experienced the miraculous events of angelic choirs yet looked beyond the grandeur of night to the horrors of the future. 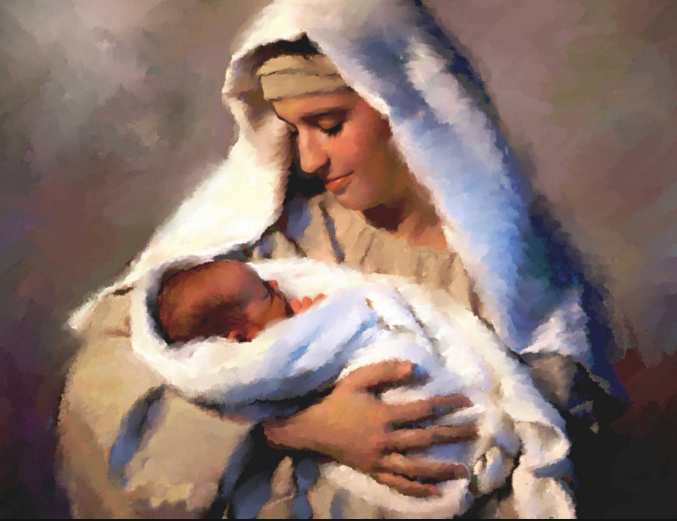 This night, this first Christmas Eve, Mary wanted this Baby, who would mean so much to so many, to simply be hers. All mine in your holiness, Baby Divine. Sing on and adore, for tonight you are mine. The wise men are coming to worship their king. The shepherds are kneeling, their homage to bring. No harm can befall thee, then sleep, Baby, sleep. While legions are singing in joyous delight. For you are a king, but tonight you are mine. Away, spectered future of sorrow and plight. Away to the years that must follow tonight. The red drops on Calvary, not, Lord, for him! Mary’s Lullaby, Bertha Kleinman, click here to listen to the song. While the story of Christmas is filled with wonder an awe, let’s not lose sight of the human side of this glorious event. There, on the floor of the dirty yet sacred stable sat a young mother holding her new born baby for the first time. This touching scene was embedded in my heart through a little known song sung by a dear friend many years ago.